1. Clark, C.G. ; Diamond, L.S. Ribosomal RNA genes of 'pathogenic' and 'nonpathogenic' Entamoeba histolytica are distinct. Mol. Biochem. Parasitol. 1991, 49 (2), 297-302. 2. Diamond, L.S. ; Clark, C.G. A redescription of Entamoeba histolytica Schaudinn, 1903 (Emended Walker, 1911) separating it from Entamoeba dispar Brumpt, 1925. J. Eukaryot. Microbiol. 1993, 40 (3), 340-344. 3. Clark, C.G. ; Diamond, L.S. Entamoeba histolytica: An explanation for the reported conversion of ''nonpathogenic'' amebae to the ''pathogenic'' form. Exp. Parasitol. 1993, 77 (4), 456-460. 4. Petri, W.A., Jr.; Singh, U. Diagnosis and management of amebiasis. Clin. Infect. Dis. 1999, 29 (5), 1117-1125. 5. Ravdin, J.I. Amebiasis. Clin. Infect. Dis. 1995, 20 (6), 1453-1464. quiz 1465-1466. 6. Stanley, S.L., Jr. Amoebiasis. The Lancet 2003, 361, 1025-1034. 7. Rajak, C.L. ; Gupta, S.; Jain, S.; Chawla, Y.; Gulati, M.; Suri, S. Percutaneous treatment of liver abscesses: Needle aspiration versus catheter drainage. AJR Am. J. Roent-genol. 1998, 170 (4), 1035-1039. 8. Tandon, A.; Jain, A.K. ; Dixit, V.K. ; Agarwal, A.K. ; Gupta, J.P. Needle aspiration in large amoebic liver abscess. Trop. Gastroenterol. 1997, 18 (1), 19-21. Petri, W.A., Jr.; Ravdin, J.I. Protection of gerbils from amebic liver abscess by immunization with the galactose-specific adherence lectin of Entamoeba histolytica. Infect. Immun. 1991, 59 (1), 97-101. WHO/PAHO/UNESCO Report of a Consultation of Experts on Amoebiasis. Wkly. Epidemiol. Rep. World Health Organ. 1997, 72, 97-99. http://www.tigr.org/e2k1/eha1 (accessed June 2004). http://www.sanger.ac.uk/Projects/E_histolytica/ (accessed Feb 2004). Willhoeft, U.; Tannich, E. The electrophoretic karyotype of Entamoeba histolytica. Mol. Biochem. Parasitol. 1999, 99 (1), 41-53. Tachibana, H.; Ihara, S.; Kobayashi, S.; Kaneda, Y.; Takeuchi, T.; Watanabe, Y.; Fujiwara, T.; Rivera, W.L. ; Silva-Tahat, M.R. ; Uemura, H.; Kanbara, H. Differences in genomic DNA sequences between pathogenic and non-pathogenic isolates of Entamoeba histolytica identified by polymerase chain reaction. J. Clin. Microb. 1991, 29 (10), 2234-2239. 15. Tannich, E.; Horstmann, R.D. ; Knobloch, J.; Arnold, H.H. 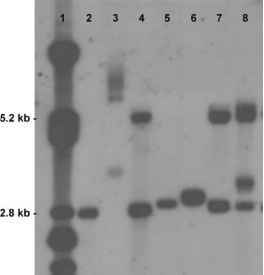 Genomic DNA Differences between pathogenic and nonpathogenic Entamoeba histolytica. Proc. Natl. Acad. Sci. U. S. A. 1989, 86 (13), 5118-5122. 16. Tachibana, H.; Kobayashi, S.; Takekoshi, M.; Ihara, S. Distinguishing pathogenic isolates of Entamoeba histolytica by polymerase chain reaction. J. Infect. Dis. 1991,164 (4), 825-826. 17. Tannich, E.; Burchard, G.D. Differentiation of pathogenic from nonpathogenic Entamoeba histolytica by restriction fragment analysis of a single gene amplified in vitro. J. Clin. Microbiol. 1991, 29 (2), 250-255. 18. Acuna-Soto, R.; Samuelson, J.; De Girolami, P.; Zarate, L.; Millan-Velasco, F.; Schoolnick, G.; Wirth, D. Application of the polymerase chain reaction to the epidemiology of pathogenic and nonpathogenic Entamoeba histolytica. Am. J. Trop. Med. Hyg. 1993, 48 (1), 58-70. 19. Aguirre, A.; Warhurst, D.C.; Guhl, F.; Frame, I.A. Polymerase chain reaction-solution hybridization enzyme-linked immunoassay (PCR-SHELA) for the differential diagnosis of pathogenic and non-pathogenic Entamoeba histolytica. Trans. R. Soc. Trop. Med. Hyg. 1995, 89 (2), 187-188.